The Diva C.L Dimmer features advanced dimming circuitry that is designed for compatibility with most high efficacy light bulbs. Screw-in dimmable compact fluorescent lamps (CFLs) and screw-in dimmable light emitting diode lamps (LEDs) are a great energy-saving alternative to incandescent or halogen light sources; however, your standard Dimmer will not dim these light sources. The Diva C.L works with dimmable CFL and LED screw-in bulbs, and is also compatible with standard incandescent and halogen bulbs, allowing you to control all 4 bulb types on the same circuit. With the same features as Lutron's Diva Dimmer, the large paddle switch turns the light on/off and returns to your favourite setting. The Diva 150 Watt C.L works with dimmable LED and CFL screw-in bulbs up to 150 Watts and is also compatible with up to 600 Watts of standard incandescent and halogen bulbs, allowing you to control all 4 bulb types on the same circuit. It is designed to control a broad range of dimmable LED and CFL bulbs from a variety of brands including Philips, Cree, GE, Eco Smart and Lighting Science. With the same features as Lurton's Diva Dimmer, the large paddle switch turns the light on/off and returns to your favourite setting. The discreet slider adjusts the light level to suit any activity. Please see Lutron's Compatible Bulb List to view the current listing of compatible bulbs that work with this dimmer. Coordinating Claro wall plate included. 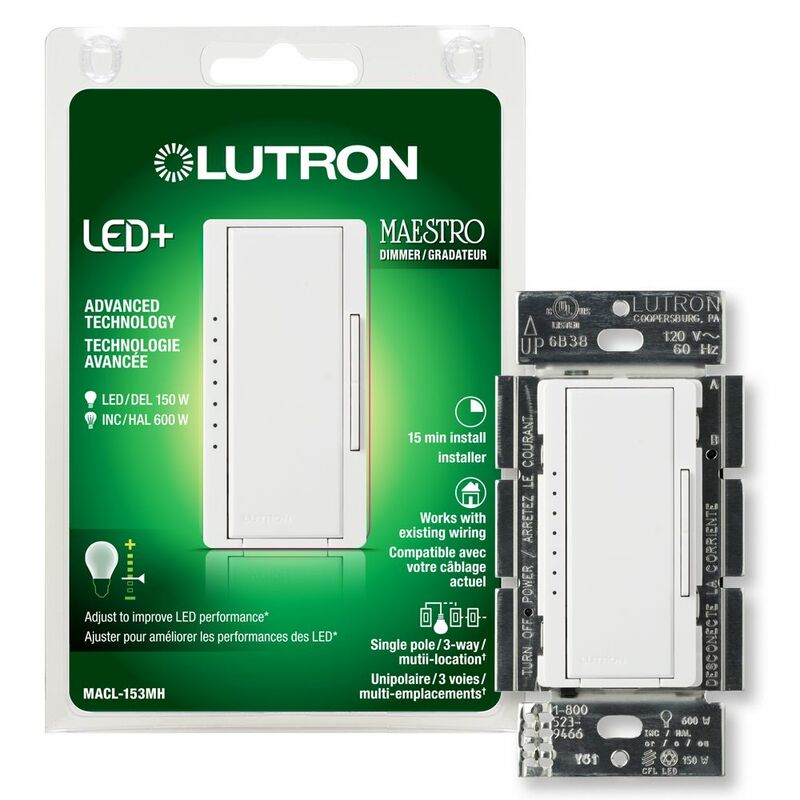 Let Lutrons Maestro CFL LED Occupancy Sensing Dimmer turn the lights on and off to your favourite level. Its a simple, easy, and low cost way to save energy and add light automation to your home. Install a Maestro Occupancy Sensing Dimmer and lights turn on when you enter the room, and then turn off automatically after you leave. The dimmer works just like a Lutron Maestro dimmer, gradually turning lights on and off, allowing your eyes to adjust to the new light level. Use the rocker to adjust the light level for any activity, or set the preset level to ensure lights always turn on to your desired light level. Equipped with ambient light detection, you can customize your sensing dimmer to detect daylight so lights dont turn on with enough natural light in your room. Keeping the sleek design of the Maestro family, Lutron sensors will match the decor of any room in your home. Maestro 150-Watt Single-Pole/3-Way/Multi-Location Digital LED/CFL Dimmer in White is rated 5.0 out of 5 by 1. Rated 5 out of 5 by Ontario1 from Stylish Dimmer - Easy to Install and Operate I purchased and installed this dimmer today from Home Depot. I have it installed for operating our dining room lamp with only one light switch. With this simple configuration, it was simply a matter of fitting the two black wires from the existing switch wiring to the two side screws on the dimmer and attaching the green ground wire on the dimmer to the electrical box. Fits standard electrical boxes. Wire nuts and screws and one jumper wire are included. Easy to operate - touch on/off, and dimmer adjustment toggle on the right side of the dimmer. The current dimmer setting is indicated by a glowing LED on the left side of the dimmer (series of lights, one of which is illuminated depending on the dimmer setting). When the unit is off that same LED is slightly illuminated. The unit will return to that level when the push button is touched once (or it will go to full brightness if touched twice). (Advanced programming instructions are available at the Lutron website for adjusting this to a "favourite" setting instead.) The unit operates silently and no buzzing is evident. The Lutron Claro cover plate is sold separately. I also purchased the cover plate to match the dimmer and enjoyed the fact that this two piece cover plate has no exposed screw heads. This dimmer is quite expensive as is the cover plate, but the unit operates well and I am glad that I made the purchase.